Moving right along with my Once Upon a Time binge watch. This remains a very inconsistent show, but… I’m still watching. You recall how I said the “will they/won’t they” saga of David and Mary Margaret was equivalent to a story masturbating? I think they’re risking friction burn at this point. Not much else to say beyond that. I am finding myself rather confused by David’s character. In the fantasy world, he’s awesome, but in Storybrook, he’s such a slimy, spineless wimp I just want to shove him down a flight of stairs. I’m not sure whether to interpret this as effects of the curse, poor writing, or what, but David is nothing like Prince Charming, despite ostensibly being the same person. Thankfully, this episode isn’t totally without its saving graces. Mainly, the fantasy storyline is pretty entertaining. 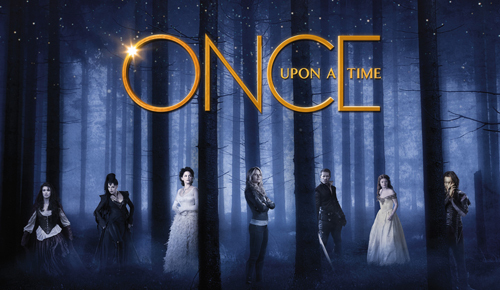 It features Charming doing battle with a siren in order to save the true love of Abigail, his arranged fiance and his Storybrook wife. It shows Charming at his most selfless and heroic, a stark contrast to the scumbag he is in Storybrook. Grumpy is one of my favourite characters on this show, so it gives me great pleasure to say the spotlight is on him in this episode. In the fantasy realm, we discover that he wasn’t always Grumpy. He was once called Dreamy, and true to his name, he dreamed of a life beyond toil in the mines, a life spent with a fairy who had captured his heart. But this isn’t one of those fairytales with a happy ending. On the Storybrook side, Mary Margaret tries to sell candles to support the local convent, but her reputation as a tramp is making everyone avoid her like the plague. A chance meeting with a nun — who was the fairy back in the land of magic — inspires Leroy/Grumpy to help Mary Margaret, despite his being the only other person in town as unpopular as her. Meanwhile, Emma investigates the disappearance of David’s wife. There’s some suspicion around David himself, but I’d be shocked if all the evidence doesn’t turn out to have been fabricated by Regina. She’s probably behind the disappearance, too. 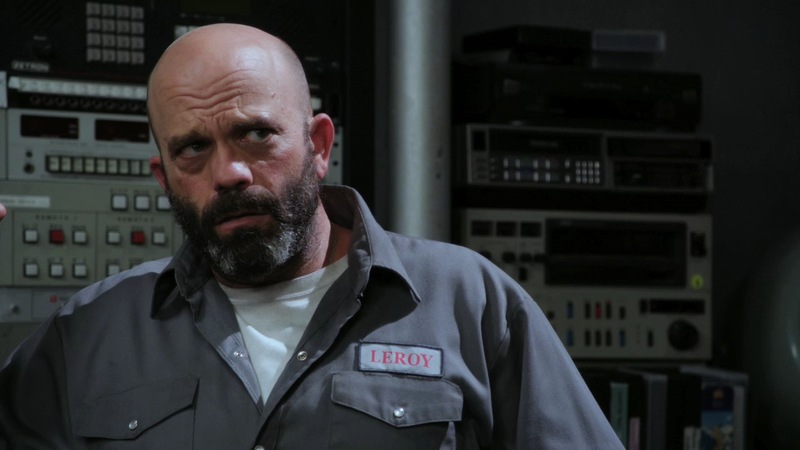 A large majority of what makes this episode so strong is just how awesome Grumpy/Leroy is. He’s this perfect blend of gruffness, gravitas, humour, and heartfelt emotion. He’s one of the most well-rounded characters of the series, and the actor does a fantastic job. On the other hand, Nova/Astrid was a weak point. Her constant buffoonery and ditziness quickly stopped being endearing. It’s not easy for a woman that beautiful to be irritating, but she managed. The events that drove Nova and Dreamy apart were a bit weak, too. I would have liked to have seen them come up with something better than the fairy godmother saying “You’re not right for each other” and Dreamy just giving up. I even buy the idea that a Dwarf and a Fairy just couldn’t work,* but it could have done with a bit more showing and a bit less telling. But Grumpy is awesome, and there’s a good emotional heft to the episode. I’ve got a soft spot for unrequited love stories, and this one was mostly well done, especially on the Storybrook side. Here’s a small milestone: This is the first episode I’d seen before. If memory serves, it was the first episode of Once Upon a Time I saw, and that’s probably a good thing, because it’s a very strong episode. The focus this time is on Ruby, whose true identity is Red Riding Hood. In the fantasy realm, she chafes under the over-protection of Granny as the town is terrorized by a terrible wolf. She longs to run away with her lover, Peter. 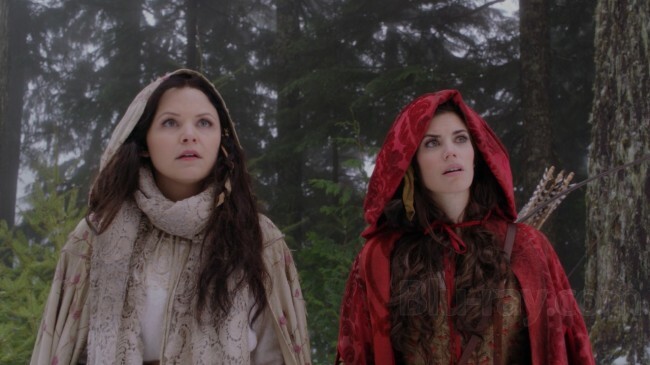 A chance meeting gains her a friend in Snow White — under the alias of Mary Margaret — and Red convinces her to help find and slay the wolf. They soon discover this is no ordinary wolf, but a shapeshifter, and all evidence points to Peter as the culprit. The ladies hatch a scheme to protect the townsfolk from Peter, and Peter from the townsfolk. But their theory proves terribly, tragically wrong. Peter isn’t the wolf. Red is. In Storybrook, Ruby is similarly restless, and she quits her job as a waitress at Granny’s Diner. She ends up working for Emma, and when David disappears in the forest, apparently losing touch with reality, Ruby proves instrumental in tracking him down, her enhanced senses as a werewolf having transferred to the real world. Red is another character I’m very fond of, and it was nice to see her get her moment in the sun. She’s a character with more depth than it seems at first glance, and like many Once Upon a Time characters, she has a very pure heart. Granny is awesome, too. 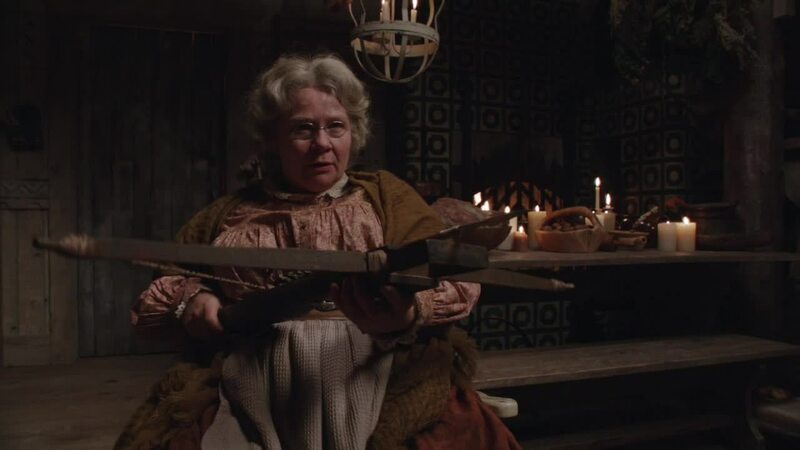 Fiction has a lot of badass old men, but it’s not so often you find a badass old woman. I’m also impressed by how dark this episode gets. Having Red kill and eat her beloved through a tragic misunderstanding is pretty damn shocking, especially for a show that’s usually so sugar sweet. Similarly, the Storybrook side of things goes to some pretty dark places. A box with a human heart in it? A box covered in Mary Margaret’s fingerprints? That’s fairly shocking. Now, I don’t doubt she’s innocent, but that’s a pretty good predicament to stick the characters in. In a show that is often hit and miss, “Red-Handed” is most definitely a hit. Things aren’t looking very good for Mary Margaret. The evidence just keeps piling up to indicate that she murdered David’s wife. We as viewers know she must be innocent, but Emma and her other friends will have an uphill battle to prove it. The only source of hope is Mr. Gold, who inexplicably offers to serve as her legal defense. But his aid is always a double-edged sword at best. On the fantasy side of things, Snow goes on a brutal quest for vengeance against the queen, having forgotten Charming through Rumpelstiltskin’s magic. The continued trials of Snow and Charming is starting to feel a bit repetitive — I wish they’d just get together already — but at least it’s still a lot more interesting than their Storybrook plot. This version has magic and swords, after all. This was overall an interesting episode, with good tension and some decent emotional beats, but it didn’t really do much to advance the story. Mary Margaret was in trouble before; now she’s just in slightly more trouble. Feels like just set-up for the future. Here we have an odd little tangent of an episode. While pursuing the escaped Mary Margaret, Emma is kidnapped by a deranged fellow named Jefferson. He turns out to be one of the few people in Storybrook who remembers their past self. He was the Mad Hatter, though his story is a bit different in this version of things. He was a devoted father driven mad by being separated from his daughter. 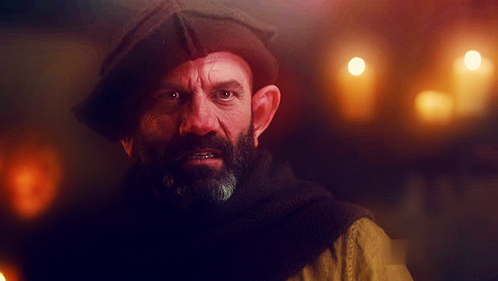 His existence in Storybrook keeps him forever apart from his beloved daughter, and he is desperate to find an escape. He believes Emma can open the way for him, what with the whole “Chosen One” thing and all. Jefferson himself was entertaining enough, and it was a decent twist on the traditional Mad Hatter story. But it was an episode focused almost entirely on Emma, and that’s never a good thing. At this point, Emma’s utter rejection of Storybrook’s true nature is just making her come across as exceedingly dense. I get it’s outlandish and all, but the evidence just keeps piling on. The ending seems to hint she’s finally getting suspicious, but we’ll see. I’ve been disappointed before. Foolishness may also run in the family, as I don’t understand what Mary Margaret hoped to accomplish by breaking out of jail. I understand no one wants to be tried for murder, but what was running aimlessly through the woods with no help and no plan going to do, exactly?